Quickly load and unload trucks, trailers and rail cars from ground level when no freight dock exists. Increase productivity while reducing material handling costs. Great for construction sites. A manual two-speed hand crank for easy one person height adjustment offers a service range of 45" to 62". 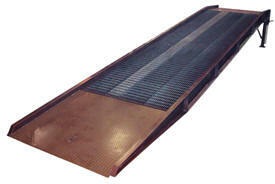 Available in 30 foot of straight ramp or 36 foot overall length; 30 foot of straight ramp and 6 foot level off. Standard features include: 8-5/8" steel wheels, positive traction open steel grating, safety locking chains, 4" high steel safety curbs, rubber bumpers, 13 7/8" usable lip support edge, tow bar pocket and welded steel construction. Painted neutral earth-tone brown. All units must ship flatbed truck. 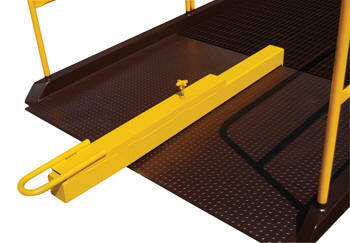 Include and Edge-Of-Dock Leveler at the truck end. Ramp height is fixed at 50". 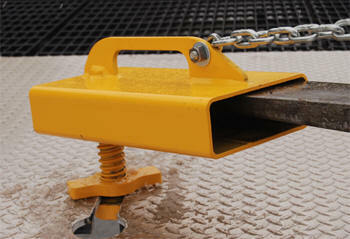 Leveler offers service range of +/- 5". Standard US D.O.T. galvanized guard rail to spanthe entire length of your yard ramp. 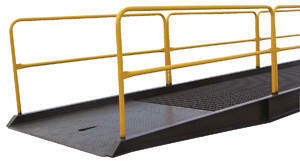 These rails increase safety by mounting 4" above the standard 4" high safety curbs. 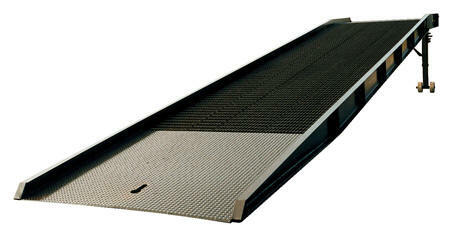 Our 12" high guard rail protects against accidental run-off. YR-HDRL Non-Removable 42" high steel handrails w/21" midrail (welded) 9/ft. YR-RHDRL Removable 42" high steel handrails w/21" midrail 9/ft. YR-RAHDRL Removable 42" high aluminum handrails w/21" midrail 3/ft.